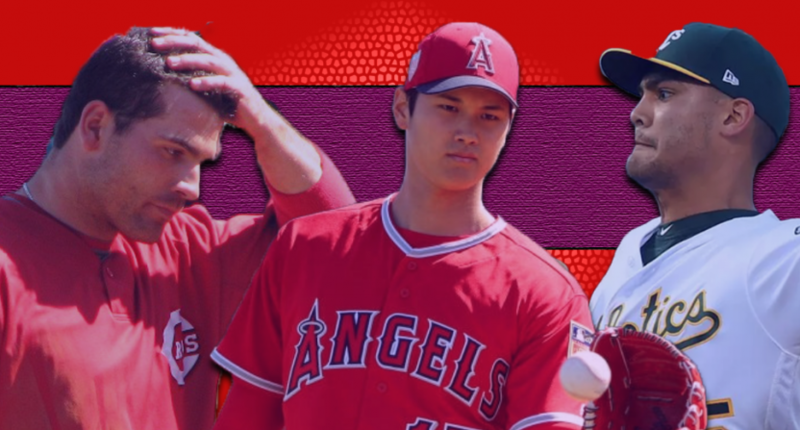 From top teams underachieving to Sean Manaea no-hitting the Red Sox to Shohei Ohtani's brilliant performance, baseball has been full of surprises. Baseball season is just about a month a month old, and while some things have played out exactly as we might have expected — the Astros are good, the Marlins are not, Mike Trout is a deity, etc. — others certainly have not. What or who has been the biggest surprise in baseball this season? Alex Putterman: Coming into this season, there were seven teams we all expected to stand head and shoulders above everyone else — the Astros, Dodgers, Cubs, Yankees, Red Sox, Indians and Nationals. Well a month into the season, the four AL teams have played their part, each boasting a winning percentage of .591 or better, but the NL teams resoundingly have not. The biggest surprise in baseball, to me, is that the Cubs, Nationals and Dodgers all find themselves hovering near (or below) .500, in third place or worse in their divisions. Now, it’s not likely that all three of these teams will remain so unimpressive over the course of the season. The Nationals will get their injured stars healthy, the Dodgers will see bounce-backs from slumping veterans, and the Cubs will sort through their pitching woes. But in light of these teams’ slow starts, and the warts each squad has shown along the way, none of the three look like the lock they seemed to be on Opening Day. Andrew Bucholtz: The biggest surprise for me has been just how good Shohei Ohtani has been, both on the mound and at the plate. I thought there might be some adjustment issues early, and I figured he might struggle in one or the other area early on; after all, there’s a reason that there have been very few at-all recent pitchers to regularly appear in the lineup. But Ohtani has been outstanding both with the bat and on the mound, and he’s been one of the most exciting MLB players to watch so far this year. Many were skeptical if he’d live up to the hype; for me, so far, he’s blown way past it. Matt Clapp: I’ll go with the Cincinnati Reds and how unbelievably awful they’ve been. Look, we knew the Reds wouldn’t be “good.” The expectations were a low 70s-win team, and they’ve won below 70 games for three straight seasons. But there was reason to expect them to be at least a little bit better due to a better/more promising pitching staff. Luis Castillo, Tyler Mahle, Amir Garrett, Raisel Iglesias and company make for an intriguing group on paper, after the Reds had far and away the worst pitching in the majors in 2016 and 2017. But here we are through 24 of their games in the 2018 season, and they’re again far and away the worst staff in baseball statistically. Their team record? Oh, that’s 5-19, good for .208 winning percentage, the worst in the majors. Offensively, Cincinnati hasn’t been much better, with even Joey Votto struggling (he’ll probably be more than fine, but he’s 34, and who knows when the decline comes). It seemed impossible for any team to be worse than the Marlins, and the Reds’ roster certainly looks better on paper, but who knows at this point. FanGraphs currently projects the Reds for 64 wins (the Marlins are projected for 63), and who would argue against that right now? I’ve ripped the organization for years with how they’ve handled the rebuild. They waited too long to trade Aroldis Chapman. They waited too long to trade Todd Frazier. As Mike Ehrmantraut advised in Breaking Bad, don’t choose a half measure. Don’t go halfway on the rebuild and accept what you are. Don’t wait to trade a current star, and do what you can to maximize the return of long-term assets. They should look to deal star closer Raisel Iglesias (signed cheaply through 2020) for a great prospect haul this July, but they will probably wait too long to trade him too. This is how bad teams stay bad. There’s been little reason for optimism for four straight years with this team. They seem as far away as ever from contention. Joe Lucia: Sean Manaea no-hitting the Red Sox shocked the hell out of me for a number of reasons. 1.) Manaea had a 4.37 ERA last season. 2.) The Red Sox came into the game against Manaea with a 17-2 record. 3.) Boston also came into the game with baseball’s best offense and hadn’t been shut out since last August. 4.) Not that it’s relevant, but the Red Sox hadn’t been no-hit in 25 years. Naturally, Manaea utterly dominated Boston last Saturday, giving baseball it’s most shocking no-hitter since… well, baseball’s last no-hitter last June (hello, Edinson Volquez). It’s possible this is all a mirage, and again it’s a small sample, but I thought he was broken beyond repair. The fact that he’s managed even a couple of weeks with this level of output is more than I thought we’d see this year for him. Ian Casselberry: I didn’t necessarily expect the Washington Nationals to be running away with the NL East at this point of the season. But I certainly didn’t expect the Nats to be in fourth place with an 11-14 record. Sure, the Mets had a chance to contend if their starting rotation stayed healthy. The Phillies looked poised for MLB’s best turnaround. And the Braves are loaded with young talent. But all three teams ahead of the Nationals in the division? Should Daniel Murphy be the NL MVP? Most of us had Bryce Harper pegged for that award, but if Murphy’s absence is that impactful on the Nats, maybe we were looking at it wrong. OK, that’s an oversimplification. Besides, Howie Kendrick is hitting pretty well as his replacement. Maybe it would help if Wilmer Difo was hitting more. But Anthony Rendon and Adam Eaton being out hurts too. As does Ryan Zimmerman’s awful start. Eventually, there will be a course correction as the Nats get their injured stars back. But the NL East may not be the cakewalk that was expected going into the season, and the mettle of new manager Dave Martinez is being tested early on.